Celebrating our Ancestry, Stories and Struggles through Food, Song, Drumming and Conversation. Join BoomShake Music for a celebration of music in dangerous times. As we do the hard work of defending our communities - from a national regime of violence and racism as well as local threats of displacement - we also explore how music can help us survive, heal, and resist. Hosted by participants in BoomShake's workshops for women and trans folks, family, friends and community will sing, chant, move, drum, and eat together guided by stories of our struggles, dreams, ancestral traditions, and childhood memories. 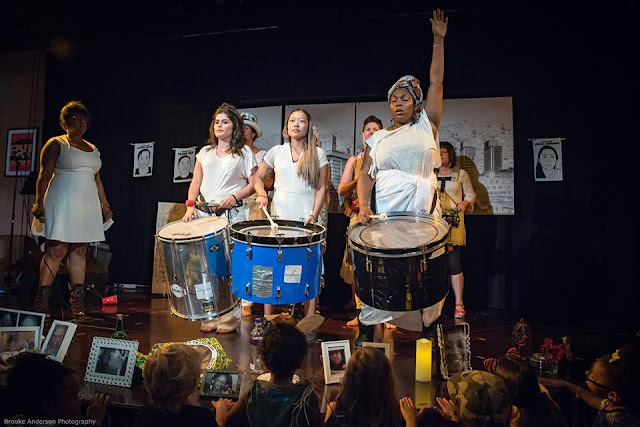 DrumLuck highlights the leadership of women, trans folks, and people of color - in music, community and struggle. All people - of all ages! - are welcome. Bring a dish to share that reflects or reinterprets your ancestors' food, and bring instruments if you have them! (Sign Up Using The Potluck Sign Up Sheet). Be ready to make rhythm and move in celebration.